Concord, MA. 29 Apr 2009. Copyright David Sibley. Congratulations - you have completed Bird Topography - upperparts and wings. The scapulars grow from the shoulder and cover the base of the wing from front to back. These could be confused with the lesser coverts (so I did not include that as an option here) but the yellow feathers indicated by the arrow look relatively long, arching down from the shoulder like scapulars, rather than the short flat contours of the lesser coverts. 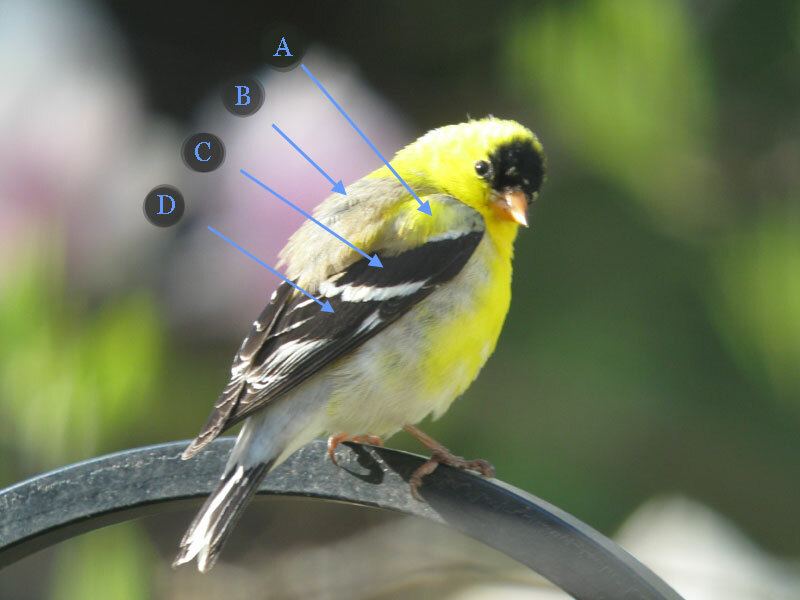 The mantle feathers grow from the center of the back, between the scapulars. On this bird the mantle is still all non-breeding plumage - faded pale gray-brown - while the nape and scapulars have molted to yellow breeding plumage. How do prednisone tablet mims I get started..
On songbirds the greater secondary coverts always form a more or less rectangular panel just forward of the middle of the wing. On this bird they are mostly black, with contrasting white tips that form a wingbar. The secondaries are the large wing feathers on the "arm" or inner part of the wing. Here they are mostly black, with white edges towards their tips that form a pale panel there and leave a solid black patch at the base of the secondaries, indicated by the arrow. Thank you for the quiz. Very helpful. I would love to see an illustration of the extended wing showing the feather topography and how that corresponds to the folded appearance. Thank you for all the great information you provide!